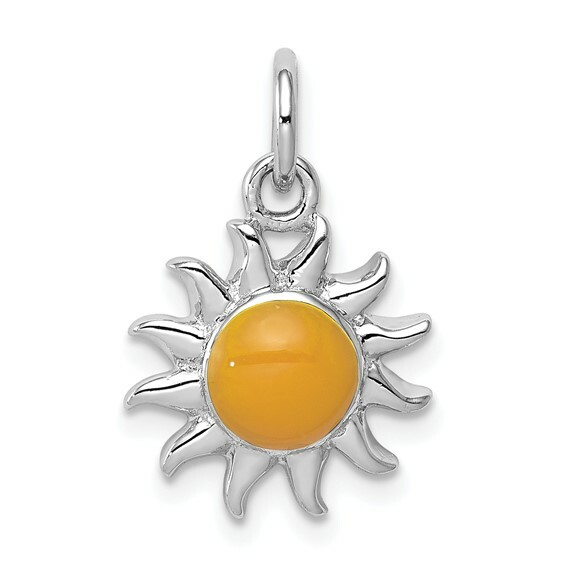 Yellow sun charm is made of polished sterling silver. Weight: 1.1 grams. Item measures 1/2 inch tall by 1/2 inch wide without bail. This charm is an addition to a bracelet that I gave my granddaughter at baptism. Each birthday or special occasion until there 16th birthday I will be adding another unique charm! I do this for my other granddaughter as well! This charm was a gift for my niece/god daughter. Every year for her birthday and Christmas we get her a charm for her charm bracelet. I love that this sunshine charm is playful enough for her to wear it now, but simple & elegant enough for it to be appropriate when she is older.